I worked for several years at the largest art library in America — Columbia University’s Avery Architectural and Fine Arts Library. Consequently, I haven’t enjoyed the art of “altered books.” I know most “altered” books were scheduled to be recycled or incinerated, but on a gut level, this twangs my heartstrings in a minor key. “MAPS,” a four-person show at June Fitzpatrick, doesn’t shy away from “altered” art — it even soars on it. All four artists (Shannon Rankin, Irmari Nacht, Susan Prince Thompson, Jeff Woodbury) include altered books or maps in their work — usually with highly successful results. Books 82, Atlas” by Irmari Nacht. It’s easy to see older maps as outdated because we think of them as data tools. But while it pains us to see a classroom globe still showing the former Soviet Union, it’s hardly different from textbooks filled with dusty information. In the context of this show, however, I had no problem thinking Irmari Nacht’s torn books are beautiful. Her “Books 82, Atlas” is a map book splayed open and standing upright. Much of the paper has been “slivered, sliced and folded” like it’s sporting a fabulously bushy hairdo. We know an atlas as a book of maps, but we also know Atlas as the mythological titan who held up the world. Nacht’s piece is a well of witty and insightful metaphors. And it’s beautiful. 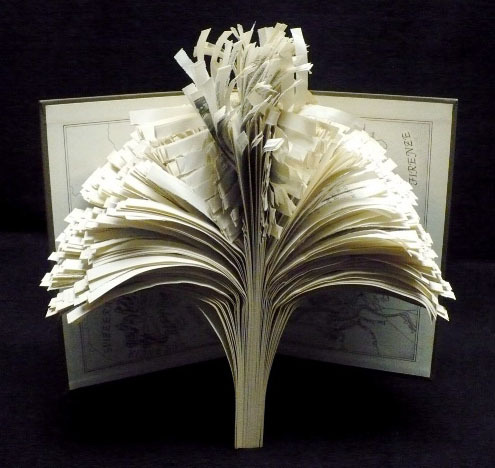 Two more books altered by the New Jersey-based artist seem to gush like paper fountains. The other atlas piece, however, looks like a wounded book — bedraggled, soaked and destroyed. It pains me just to look at it. My favorite work in the show is by Jeff Woodbury. His razor-cut maps, for all their obsessive patience, are as hilarious as they are fascinating. Boxed in Lucite vitrines, several are folded in that cloying impossible map way. Viewing the layered strands is like peering through a dense stand of winter-naked branches. You could probably unfurl one, but I bet Woodbury would have to charge you to fold it back up. The layered and linear complexity of the cut maps is echoed in several prints pulled from the plates on which Woodbury scored them. These suave prints might appear less mischievous than his other works, but their dash only fuels the brilliance of their wit. In contrast to his cutouts, Woodbury also presents a set of smaller maps made only of thick, painted lines: no paper, no canvas, no support — just paint. These include the Montreal and Boston subways and Lake Tahoe’s Heavenly Ski Resort. Whether sculptures or paintings or drawings (take your pick), these could actually be folded and placed in your pocket. 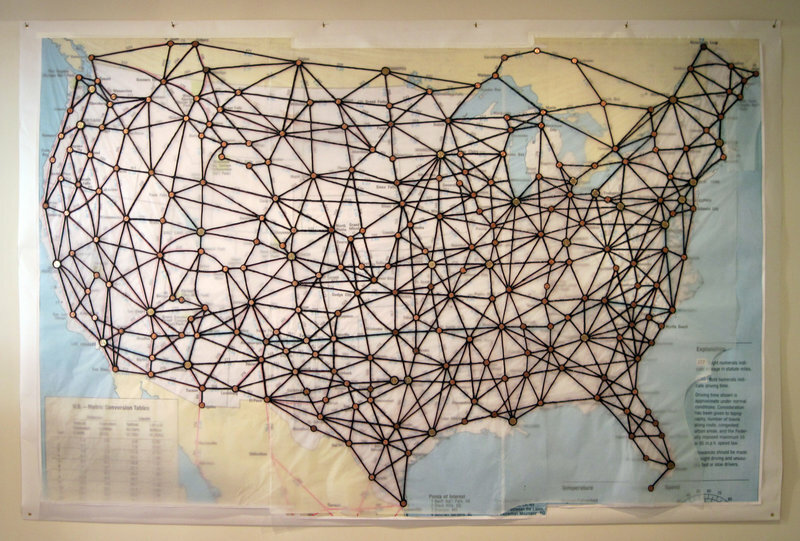 Woodbury’s major work in the show is “Time Is Money” — a huge map of the major road waypoints across America and Canada made in Woodbury’s inventive drawing/painting/sculpture mode. It features thick black (oily?) lines with pennies and gold dollar coins at the intersections — and Canadian coins above the border. While intended to be removed, Woodbury has left the paint lattice on the map used to create this piece. This makes the piece easy to understand, but I would love to see the lattice naked on the wall as intended. Still, it is awesome. I think of “Maps” as something of a showdown between Woodbury’s scintillating pith and Shannon Rankin’s refined sophistication. 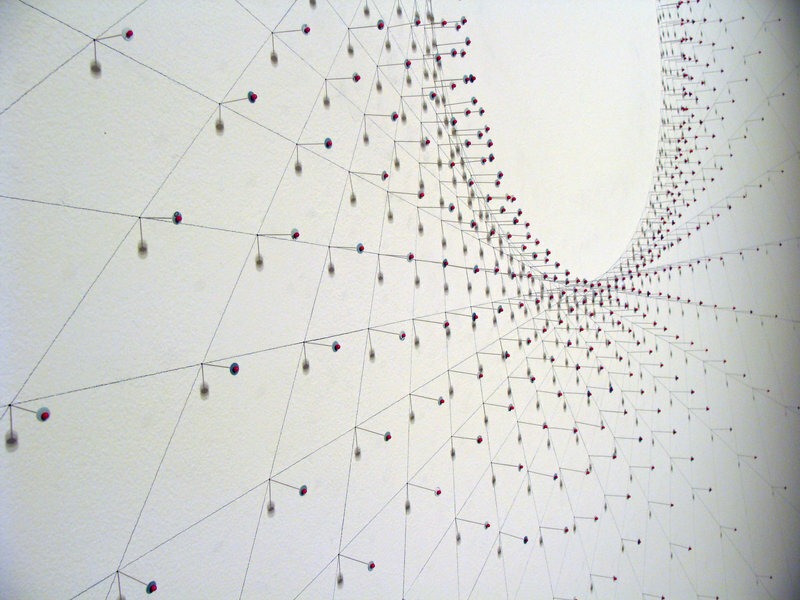 Her “Charted” is a large installation piece on the back wall of the gallery made by pins (with tiny circles cut from maps just under their blood-red heads) spaced on 40 pencil lines radiating from a central circle. It’s like a sun radiating in celebration of form and series. Rankin’s touch is a winsome grace to Woodbury’s bitingly brash brilliance. Her precision has a geometrical rather than material flair that pushes her work toward abstraction. Like most of her work, it’s almost impossible to read “Charted” as a map piece instead of a meditation on mathematical forms. Rankin’s work seems to approach maps through the mathematical logic of map-making rather than the physicality of topographical fact. This more universal approach gives her work easy access to geometrical forms, thereby making the works very easy to approach and enjoy. They don’t call out to be interpreted, read or identified — and in this sense they are very much handsome works of contemporary art. They are serious and contemplative, but quietly so. “Maps” is a handsome, smart and challenging show that largely features two of my favorite regional contemporary artists. The work is reasonably priced and beautifully installed. This is one of Maine’s very best shows of 2010.